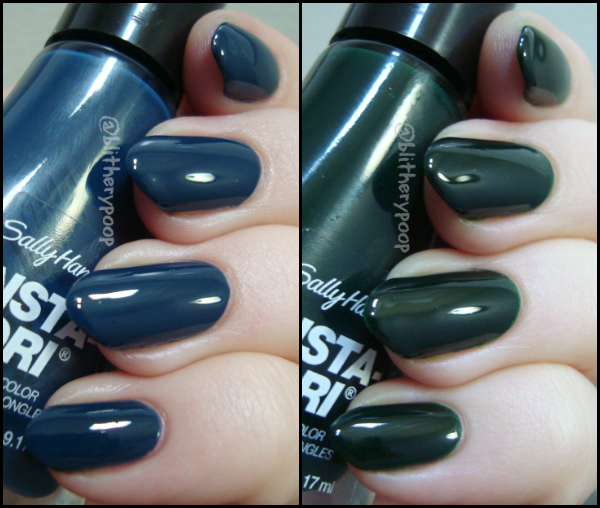 Am I nuts or does it seem like Sally Hansen is really picking up speed with new collections? I don't even know if I should call this collection "early spring" or "late winter" or what, since it came out in January. It's one of three or four new Insta-Dri displays to turn up in drugstores since xmas, some core and some limited edition. This bunch is LE. There's actually been another LE one that's only just started turning up and is definitely a spring collection. I'm leaning toward calling it early spring, if only because there's a similar Xtreme Wear collection that came out right around the same time and has butterfly-ish names. (Two of those will wander onto the blog soonish.) It's not just the lack of season that's hanging me up here. This collection doesn't actually have a name. Hmm. Well...whoever these two are, let's get a better look at them. 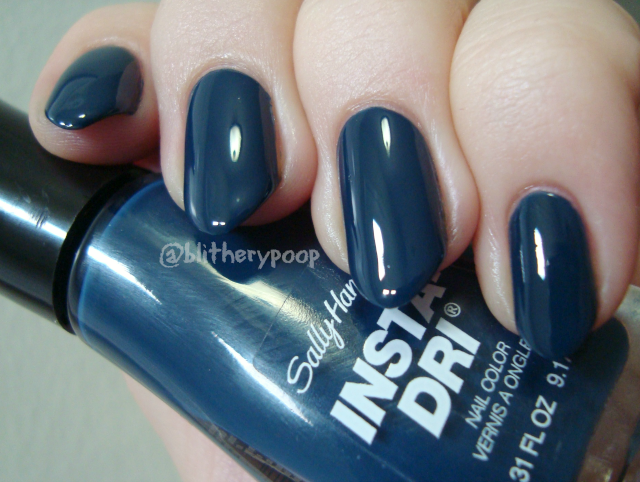 Royal Reign is a deepened cornflower blue, softened without being dusty. One thing I feel like I always say in Insta-Dri reviews is that they (almost?) never seem to live up to the claim of being one-coaters. Royal Reign is a two-coater for me, which is still perfectly acceptable. The formula is good, thickish and creamy. I think this particular shade can almost make the claim because one thicker coat on shorter nails would probably give decent coverage. I think. Pretty either way, and easy to apply. Poison Ivy is a dark bottle green crelly. From pretty to downright beautiful... Wow! I'm always falling for greens like this and I know I must have something dupey, but I couldn't resist! Poison Ivy is along the same lines as Nars Zulu, Illamasqua Rampage, Sinful Colors Last Chance etc. I'll try to get a comparison done if anyone's interested. It's also a two-coater. The only gripe I have with Poison Ivy is that recurring issue I have with some formulas, pinprick bubbling. Not a huge deal for a polish this gorgeous. Bottom line: Both are good and I'll be stamping with them soon to see if this "improved" formula works as well for that as the older ones. Did you get anything from this or any of the other bajillion new Sally Hansen collections? If it came out in January then it could be a winter collection. Technically winter goes roughly from December 21st to March 21st. There would have been roughly 2 months left of winter. Why yes, I got Get Down from the Xtreme Wear collection, a LE I think, & I love it. Is kinda marsala-ish with brown & purple undertones. My thing. 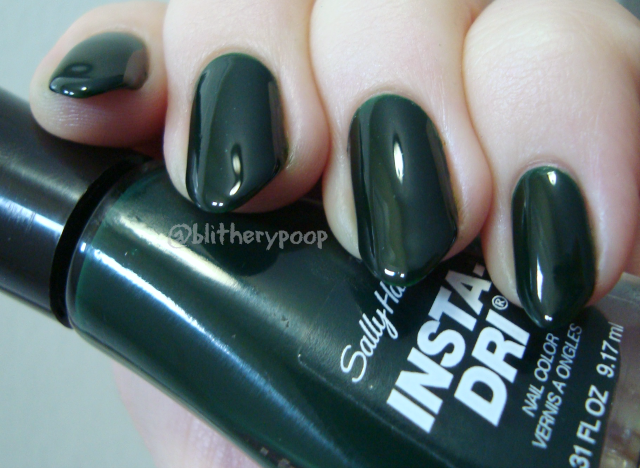 I am loving everything Sally Hansen is putting out there!